Just ask Anita Luvera Mayer. In her MAFA 2015 workshop, she taught students a range of dyeing and embellishment techniques. One focused on the use of rust and black tea to dye and design fabric. I came close to taking her workshop, which was entitled, "Don't Change the Sheets, Change the Cloth." It sounded fun. And that's exactly what one of the participants told me when I asked about her weekend experience. "It was fun!" she exclaimed. "I believe that if a person has a passion for any activity, they will have a full and exciting life. Do not wait to "follow your bliss." Celebrate the moment and day and take time to do what you love. This sometimes means making hard choices and saying no, but if you are clear as to your priorities, this is essential. "My priorities for years have been and are: myself, my creative time, my family-- and in that order, because if I do not take care of my health and my need to create, I have little left to give to the people I love. Live now!" She swept through MAFA 2015's weekend retreat like a queen and charmed us all. She's tall and slim with a model's posture and bearing. Almost anything looks great on her. She wowed the audience at the Fashion Show as she modeled a striking white top. A professional model couldn't have shown it off better. Then, when visiting her workshop the next evening for Open Studio, we found ourselves entranced with her enthusiasm and genuine love of sharing her craft and her passion. Anita is a teacher in her heart and in her bones. She is also extremely organized. For example, her students leave with a reference notebook of instructions and samples. 'How many times do you leave a workshop and can't remember exactly what you did or how you did it?' she asked rhetorically. The notebook solves that problem. There is much to admire about Anita, but I am most impressed with her proud and unapologetic acceptance of who she is--a mature woman who knows and accepts herself. Not content to sit on the sidelines, she accepts her age, but is not defined by it. She celebrates her age as she celebrates life. As Anita says, "My moment of truth regarding my passion for clothing was the result of a two hour seminar at the first Convergence in 1972 in Detroit, Michigan. Ros Berlin, presented a program on clothing and I knew immediately where I was going with my weaving and wrote in my journal that night, June 1972, "from this day forward any major piece of clothing I wear I will make."" And she proceeded to do just that. Known for her clothing that requires little to no shaping in construction, she explains, "I "discovered" modular clothing--or actually clothing from simple rectangles and squares--because I did not know how to tailor handwoven fabric." That simple. And yet, not simple at all. it is easy to see the connection between Anita's work and the designs of ethnic cultures. She is inspired by their clothing and the creativity of women who work to adorn their bodies and clothe their families. She says, "My work always speaks, in some way, to these cultures either in the color, embellishment, or shape." Her sources of inspiration have remained much the same over the years, but her work has matured, much as her interests have evolved and she has matured as an artist. "I have created clothing that speaks to my love for the sunsets and sunrises. Then, as I got older, all my work was about honoring women with each garment speaking to age, wisdom, loss and love--all that I experienced living my life," she says. 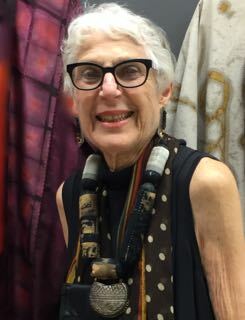 Her current body of work continues to be inspired by clothing and textiles of other cultures, but she has been working more with interesting techniques in creating the cloth. This interest was readily apparent in her workshop at MAFA 2015. She has met her 1972 goal--and then some. In addition to creating interesting pieces to her personal wardrobe, she has inspired many, many others to not only have fun in the process of creativity, but to celebrate themselves as individuals. "My goal in teaching is to help women find their own self-esteem and to honor who they are by the the clothes they wear. "Every time I teach, I come home with new ideas and questions but mostly my passion for teaching is that I so respect and enjoy the women who are involved in fiber. They are "my tribe" and I want to be with them. "If you love what you do and want to share that love, put together a workshop and submit it to conferences and guilds. I wrote articles, did "free" lectures, kept applying to conferences even though I was turned down many times." Anita Luvera Mayer wants to make it clear: She has absolutely no intentions to retire. She remains eager to do lectures and workshops for guilds. Invite me and pay me, she told us, and I'll be there. Conferences are on another scale, however, and Anita foresees a fitting end to her leadership role in conference workshops. The plan is to end where she began--with the Association of Northwest Weavers at their 2017 Conference, Treadle Lightly, in Victoria, B.C. It was the first conference she attended wearing her distinctive handwoven clothing. I, for one, can't wait to see what she'll be wearing to that event! Anita is lucky to have such a supportive husband. I was just talking to Hubs about getting a floor stand for cross stitch, and he said "Well, yeah, that's the next step."